Vol. II. Rochester, New York, Saturday, July 25, 1829. No. 12. And it came to pass, in these days that the people became sore against Horace, the publican, forasmuch as he had offended them by taking into favor Israel, the darkey paramour, and whom the people had cast off on account of his wickedness. Note: Although the above biblical-sounding satire incorporates the vulgar cognomen for Joseph Smith's "Book of Mormon" in its title, this particular episode concerns itself merely with Rochester residents and takes no special notice of incipient Mormonism nor the general happenings then transpiring in neighboring Palmyra. Vol. II. Rochester, New York, Saturday, August 1, 1829. No. 13. Note: This biblical-sounding satire continues to concern itself merely with Rochester residents and takes no special notice of incipient Mormonism nor the general happenings then transpiring in neighboring Palmyra. Vol. II. Rochester, New York, Saturday, August 8, 1829. No. 14. And it came to pass that after Israel had returned to his own abode, Horace the publican a very meek and sober man, took him by the hand, and endeavored to comfort him. And he bowed himself unto Israel and was withal so humble before him that the people must needs take offence at it. Now the rest of the deeds of Israel the "darkey paramour" how he yet liveth in shame, and of Joseph the Wanton, how they still cleave unto Israel and of Horace the publican "how he couldn't git no beef" on the fourth day of the week, and of Hiram the Jeromite, how he gave unto Israel a writing promising to cleave unto him, and how he too done the unclean thing against the body of a large oak near the precincts of the tabernacle, and of Chad the money lender how he squanders the monies of the children of Samuel the miser. Behold all these things, yea many more, are graven on the massy leaves of the Golden Book, and are now in the custody of Joseph the prophet. Note: The above biblical-sounding satire mentions Joseph Smith and alludes to his (as yet unpublished) "Book of Mormon" only at the end of this third episode in the "Golden Bible" series. Vol. II. Rochester, New York, Saturday, August 29, 1829. No. 17. Vol. III. Rochester, New York, Monday, August 31, 1829. No. 878. The Palmyra Freeman says -- The greatest piece of superstition that has ever come within our knowledge, now occupies the attention of a few individuals of this quarter. It is generally known and spoken of as the "Golden Bible." Its proselytes give the following account of it: -- In the fall of 1827, a person by the name of Joseph Smith, of Manchester, Ontario county, reported that he had been visited in a dream by the spirit of the Almighty, and informed that in a certain hill in that town, was deposited this Golden Bible, containing an ancient record of a divine nature and origin. After having been thrice thus visited, as he states, he proceeded to the spot and after penetrating "mother earth a short distance, the Bible was found, together with a huge pair of Spectacles! He had been directed, however, not to let any mortal being examine them, "under no less penalty" than instant death! They were therefore nicely wrapped up, and excluded from the "vulgar gaze of poor wicked mortals!" It was said that the leaves of the bible were plates of gold about 8 inches long, 6 wide and one eighth of an inch thick, on which were engraved characters or hyeroglyphics. By placing the spectacles in a hat, and looking into it, Smith could (he said so, at least,) interpret the characters. An account of this discovery was soon circulated. The subject was almost invariably treated as it should have been -- with contempt. A few, however, believed the "golden" story, among whom was Martin Harris, an honest and industrious farmer in this town (Palmyra.) So blindly enthusiastic was Harris, that he took some of the characters interpreted by Smith, and went in search of some one, besides the interpreter, who was learned enough to English them; but to all whom he applied (among the number was Professor Mitchell, of New York,) happened not to be possessed of sufficient knowledge to give satisfaction! Harris returned, and set Smith to work at interpreting the Bible. He has at length performed the task, and the work is soon to be put to press in Palmyra. Its language and doctrines are said to be far superior to the book of life!!! Note 1: The above is a shortened reproduction of the text of an article first appearing in the Palmyra Freeman a few days before. The shortened version of the article was also reprinted by Eber D. Howe in the Sep. 22, 1829 issue of his Painesville Telegraph. 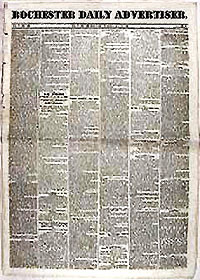 The complete Freeman text may be found reprinted in the Niagara Courier of Aug. 27, 1829. Note 2: For more details see Jonathan A.Hadley's 1842 letter, in which he refers back to his 1829 Palmyra Freeman piece, and calls it "first ever published about the Mormons." Vol. I. Rochester, New York, Saturday, September 5, 1829. No. 9. A man by the name of Martin Harris was in this village a few days since endeavoring to make a contract for printing a large quantity of a work called the Golden Bible. He gave something like the following account of it. In the autumn of 1827, a man named Joseph Smith of Manchester, in Ontario County, said that he had been visited by the spirit of the Almighty in a dream, and informed that in a certain hill in that town was deposited a Golden Bible, containing an ancient record of divine origin. He states that after the third visit from the same spirit in a dream he proceeded to the spot, removed the earth, and there found the Bible, together with a large pair of spectacles. He had also been directed to let no mortal see them under the penalty of immediate death, which injunction he steadfastly adhered to. The treasure consisted of a number of gold plates, about eight inches long, six wide, and one-eighth of an inch thick, on which were engraved hieroglyphics. By placing the spectacles in a hat and looking into it, Smith interprets the characters into the English language. Harris states that he went in search of some one to interpret the hieroglyphics, but found that no one was intended to perform that all-important task but Smith himself. Smith has interpreted the whole, and it is now in press in Palmyra, Wayne County. The subject attracted a good deal of notice among a certain class and as it will be ere long before the public, we shall endeavor to meet it with the comment it may deserve. Note: In addition to relating the account of Martin Harris (accompanied by Joseph Smith?) visiting Rochester in Aug. 1829, The Gem appears to also summarize information gleaned from the Aug. 11th issue of the Palmyra Freeman. Compare The Gem report to the Freeman article, as reprinted in the Aug. 27th issue of the Niagara Courier. Vol. XIV. Rochester, New York, Tuesday, March 30, 1830. No. 13. A NEW WAY OF RAISING THE WIND. It is frequently remarked, that any scheme, however gross, will find more or less dupes. -- The accuracy of tbe saying, is, it seems by the following advertisement from the Wayne Sentinel, to be now tested anew in this region of "excitements." An account written by the hand of Mormon, upon plates, taken from the plates of Nephi. Wherefore, it is an abridgment of the Record of the People of Nephi, and also of the Lamanites; written to the Lamanites, which are a remnant of the House of Israel; and also to Jew and Gentile; written by way of commandment, and also by the spirit of Prophecy and of Revelation. Written, and sealed up, and hid up unto the LORD, that they might not be destroyed; to come forth by the gift and power of GOD unto the interpretation thereof, sealed by the hand of Moroni, and hid up unto the LORD, to come forth in due time by way of the Gentile, the interpretation thereof by the gift of GOD. An abridgment taken from the Book of Ether. Also, which is a Record of the People of Jared, which were scattered at the time the LORD confounded the language of the people when they were building a tower to get to Heaven, Which is to show unto the remnant of the House of Israel how great things the LORD hath done for their fathers; and that they may know the covenants of the LORD, that they are not cast off forever; and also to the convincing of the Jew and Gentile that JESUS is the CHRIST, the ETERNAL GOD, manifesting Himself unto all nations. And now, if there be fault, it be the mistake of men; -- wherefore, condemn not the things of GOD, that ye may be found spotless at the judgment seat of CHRIST. BY JOSEPH SMITH, JUNIOR, Author and Proprietor. The above work, containing about 600 pages, large Duodecimo, is now for sale, wholesale and retail, at the Palmyra Bookstore, by Howard & Grandin. Vol. IV. Rochester, New York, Friday, April 2, 1830. No. 1057. The "Book of Mormon" has been placed in our hands. A viler imposition was never practised. It is an evidence of fraud, blasphemy and credulity, shocking to the Christian and moralist. The "author and proprietor" is one "Joseph Smith, jr." -- a fellow who, by some hocus pocus, acquired such an influence over a farmer of Wayne county, that the latter mortgaged his farm for $3,000, which he paid for printing and binding 5000 copies of this blasphemous work. The volume consists of about 600 pages, and is divided into the books of Nephi, of Jacob, of Mosiah, of Alma, of Mormon, of Ether, and of Helaman. -- "Copy-right secured!" The style of the work may be conjectured from the "preface" and "testimonials" which we subjoin. As many false reports have been circulated respecting the following work, and also many unlawful measures taken by evil designing persons to destroy me, and also the work, I would inform you that I translated, by the gift and power of God, and caused to be written, one hundred and sixteen pages, the which I took from the Book of Lehi, which was an account abridged from the plates of Lehi, by the hand of Mormon; which said account, some person or persons have stolen and kept from me, notwithstanding my utmost exertions to recover it again -- and being commanded of the Lord that I should not translate the same over again, for Satan had put it into their hearts to tempt the Lord their God, by altering the words, they did read contrary from that which I translated and caused to be written; and if I should bring forth the same words again, or, in other words, if I should translate the same over again, they would publish that which they had stolen, and Satan would stir up the hearts of this generation, that they might not receive this work: but behold, the Lord said unto me, I will not suffer that Satan shall accomplish this evil design in this thing: therefore thou shalt translate from the plates of Nephi, until ye come to that which ye have translated, which ye have retained; and behold ye shall publish it as the record of Nephi; and thus I will confound those who have altered my words. I will not suffer that they shall destroy my work; yea, I will shew unto them that my wisdom is greater than the cunning of the Devil. Wherefore, to be obedient unto the commandments of God, I have, thro' his grace and mercy, accomplished that which he hath commanded me respecting this thing. I would also inform you that the plates of which hath been spoken, were found in the township of Manchester, Ontario county, New-York. Note: This article was re-published in the weekly Rochester Republican of Apr. 6th, just as the Saints' "Church of Christ" was being formally organized in Manchester (Fayette? ), New York. Although previous article reprints from the Palmyra area papers had circulated far and wide, the notices in the Advertiser and the Republican appear to have particularly caught the attention of newspaper editors across the country and they were widely reprinted. A mid-April issue of the Boston Bulletin summarized the Advertiser's article and, by May 3, 1830, the news had been broadcast as far into the American hinterland as into the columns of Manchester Vermont's Horn of the Green Mountains; by May 21, 1830 it had reached Elyria, Ohio's Lorain Gazette. The latter reprint effectively advertised the forthcoming "Mormon mission to the Lamanites," through Ohio to Missouri, since the Lorain Gazette was published practically in "Rigdonite" Elder Parley P. Pratt's own backyard and because it mentioned Pratt's future missionary companions (Oliver Cowdery and Peter Whitmer, Jr.) by name. Vol. XIV. Rochester, New York, Tuesday, April 6, 1830. No. 14. BLASPHEMY -- "BOOK OF MORMON,"
The "Book of Mormon" has been placed in our hands. A A viler imposition was never practised. It is an evidence of fraud, blasphemy and credulity, shocking to the Christian and moralist. The "author and proprietor is one "Joseph Smith, jr." -- a fellow who, by some hocus pocus, acquired such an influence over a wealthy farmer of Wayne county, that the latter mortgaged his farm for $3000, which he paid for printing and binding 5000 copies of the blasphemous work. The volume consists of about 600 pages and is divided into the books of Nephi, of Jacob, of Mosiah, of Alma, of Mormon, of Ether, and of Helaman. -- "Copy-right secured." The style of the work may be conjectored from the "preface" and "testimonials", which we subjoin. Vol. II. Rochester, New York, Saturday, May 15, 1830. No. 2. Some months ago a noise was made among the credulous of the earth, respecting a wonderful production said to have been found as follows. An ignoramous near Palmyra, Wayne county, pretended he had found some "Gold Plates," as he is pleased to call them, upon which is said to be engraved characters of marvellous and misunderstandable import, which he, nor no other mortal could divine. These characters he has translated into the English language, and lo! they appear to be no other than the mysticisms of an unrevealed Bible! A person more credulous or more cunning, than him who found the plates, ordered the translation thereof, mortgaged his farm, sold all he had, and appropriated it to the printing and binding of several thousand copies of this pearl, which is emphatically of great price! The book comes before the public under the general title of the "Book of Mormon," arranged under different heads, something as follows. The book of Mormon -- containing the books of Nephi, Nimshi, Pukei, and Buckeye -- and contains some four or five hundred pages. It comes out under the "testimony of three witnesses," and of "six witnesses," who say they "have seen and hefted the plates," that "they have the appearance of gold," and that divers and strange characters are "imprinted on them." -- The author, who has the "copy-right secured according to law," says, "that he was commanded of the Lord in a dream," to go and find, and that he went and found. At one time it was said that he was commanded of the Lord not to show the plates, on pain of instant death -- but it seems he has shown them to the said witnesses, and yet is alive! At another time it is said that none could see them but he who was commanded; -- that though they should lie in the middle of the street beneath the broad glare of a meridian sun, in the presence of hundreds, yet no eye but his could see them! The translator, if we take his word for it, has been directed by an angel in this business, for the salvation and the edification of the world! It partakes largely of Salem Witchcraft-ism, and Jemima Wilkinson-ism, and is in point of blasphemy and imposition, the very summit. But it is before the public, and can be had for money, at various places. This story brings to our mind one of similar nature once played off upon the inhabitants of Rochester and its vicinity, near the close of the last war. During the war, we were subject to many inconveniences at this place, and were in constant danger of attack from the enemy, those who lived here at that time, can well remember the frequent attempts made by the enemy to land at the mouth of the Genesee, at which point our army had deposited heavy stores. Our village was then young, and the abodes of men were 'few, and far between.' If we remember aright, it was in the year 1815, that a family of Smiths moved into these parts, and took up their abode in a miserable hut on the east bank of the river, now near the late David K. Carter's tavern. They had a wonderful son, of about 18 years of age, who, on a certain day, as they said, while in the road, discovered a round stone of the size of a man's fist, the which when he first saw it, presented to him on the one side, all the dazzling splendor of the sun in full blaze -- and on the other, the clearness of the moon. He fell down insensible at the sight, and while in the trance produced by the sudden and awful discovery, it was communicated to him that he was to become an oracle -- and the keys of mystery were put into his hands, and he saw the unsealing of the book of fate. He told his tale for money. Numbers flocked to him to test his skill, and the first question among a certain class was, if there was any of Kidd's money hid in these parts in the earth. The oracle, after adjusting the stone in his hat, and looking in upon it sometime, pronounced that there was. The question of where, being decided upon, there forthwith emerged a set, armed with "pick-axe, hoe and spade," out into the mountains, to dislodge the treasure. We shall mention but one man of the money-diggers. His name was Northrop. He was a man so unlike anything of refined human kind, that he might well be called a demi-devil [sent] forth upon the world to baffle the elements of despair, and wrestle with fate. As you will suppose, he was an enemy to all fear. Northrop and his men sallied out upon the hills east of the river, and commenced digging -- the night was chosen for operation -- already had two nights been spent in digging, and the third commenced upon, when Northrop with his pick-axe struck the chest! The effect was powerful, and contrary to an explicit rule laid down by himself he exclaimed, "d----n me, I've found it!" The charm was broken! -- the scream of demons, -- the chattering of spirits -- and hissing of serpents rent the air, and the treasure moved! The oracle was again consulted, who said that it had removed to the Deep Hollow. There, a similar accident happened -- and again it was removed to a hill near the village of Penfield, where, it was pretended the undertakers obtained the treasure. About this time the enemy's fleet appeared off the mouth of the Genesee, and an attack at that point, was expected -- this produced a general alarm. -- There are in all communities, a certain class, who do not take the trouble, or are not capable of thinking for themselves, and who, in cases of alarm, are ready to construe every thing mysterious or uncommon into omens of awful purport. This class flocked to the oracle. He predicted that the enemy would make an attack; and that blood must flow. -- The story flew, and seemed to carry with it a desolating influence -- some moved away into other parts, and others were trembling under a full belief of the prediction. At this time a justice of the peace of the place visited the oracle, and warned him to leave the country. He gravely told the magistrate that any one who opposed him would receive judgments upon his head, and that he who should take away the inspired stone from him, would suffer immediate death! The magistrate, indignant at the fellow's impudence, demanded the stone, and ground it to powder on a rock near by -- he then departed promising the family further notice. The result was the Smiths were missing -- the enemy did not land -- the money-diggers joined in the general execration, and declared that they had their labor for their pains -- and all turned out to be a hoax! Now in reference to the two stories, "put that to that, and they are a noble pair of brothers." Note: Joseph Smith, Sr. moved from Norwich, Vermont to the area southeast of Rochester during the summer of 1816. His son Alvin was born Feb. 11, 1798 and would have been a few months over eighteen during the summer of 1816. Whether Alvin accompanied his father to western New York in 1816, or whether he remained behind until the rest of the family moved west at the end of the year remains uncertain. By all accounts, this Smith family was living in Palmyra (not Rochester) by the beginning of 1817. Vol. V. Rochester, New York, Saturday, November 27, 1830 No. 1249. In Batavia, on Tuesday last, by the hon. Simeon Cummings, Mr. George W. Harris, to Mrs. Lucinda Morgan, widow of the late Capt, William Morgan. Note 1: The Nov. 27th issue of the Advertiser was published on a Saturday, according to the regular schedule of that periodical. Therefore, "Tuesday last" would have been Nov. 23, 1830. This appears to establish exactly the date of Lucinda Morgan's second wedding. The Rochester Enquirer prints the date as Nov. 21, but that appears to be an incorrect report, since the Batavia papers also show the date as being Tuesday the 23rd. See the Dec. 22, 1830 issue of the Ithaca Chronicle for more information on this marriage. Vol. III. Rochester, Tuesday, November 30, 1830. No. 43. MARRIED. -- In Batavia, on the 21st inst., by the Hon. Simeon Cummings, Mr. John [sic] W. Harris, to Mrs. Lucinda Morgan, widow of the late Capt, William Morgan, who was murdered by the Freemasons under authority of the Lodge of Niagara on the 19th Sept. 1826. Note: The actual Harris-Morgan wedding date was evidently November 23rd and not November 21st. See the Rochester Advertiser of Nov. 27th. Vol. II. Rochester, New York, Saturday, December 25, 1830. No. 17. Book of Mormon. -- In the 2d number of the GEM, we gave a full length portrait of this bantling of wickedness and credulity. By a late Painesville, Ohio paper, we perceive that this pretended revelation from heaven has found some believers, and that there are preachers travelling about in those parts who pretend that it is the only revelation which men can safely live and die [by]. In Canandaigua, it is also said, that there is a book of Mormon preacher, who is attempting to push his way forward, in spite of all opposition. The reason for these efforts is obvious. When the work spoken of came before the world, it proved to be such a spawn of wickedness that the press aimed a blow at it, and it fell, ere it had scarce seen the light. The getters-up therefore, seeing their hopes all blasted, and their names coupled with infamy, have determined to 'make a raise' on the public by some means, and thus they are going about "like roaring lions, seeking whom they may devour." We do not anticipate a very great turning to this heresy. The public are too much enlightened. Note: The "Mormon preacher" in Canadaigua was almost certainly Elder Sidney Rigdon. See the Ontario Messenger of Dec. 22, 1830 for more details. Vol. XIV. Rochester, New York, Tuesday, December 28, 1830. No. ? Book of Mormon. -- Most of our readers, we presume, have heard of this pretended revelation, made to a certain few in and about Palmyra, revealing the fundamentals of a new religion. A ridiculous story was told about its discovery, golden plates were found in a stone box, a Mr. Somebody who could neither read nor write, was found able to translate them, and somebody else, equally ignorant, to transcribe them, and a worthy, honest but credulous farmer was found willing to be ruined by defraying the expense of publishing the Book of Mormon, as was to be expected, fell dead-born from the press. Here it was supposed the matter would rest, without causing even a sneer at the expense of the revelators. This however seems not to be the case. The disciples of Mormon have recently appeared in Ohio, and are propagating their new light with extraordinary rapidity, going to the credulous, and laying the foundations broad and wide for a "New Jerusalem" about to be built; and now it seems the oracle has commenced its responses nearer home. Surely it was not rightly said that "in that hour the Heathen oracles became dumb for ever." On Thursday of last week one of these seers of Mormon appeared in Canandaigua, delivered a discourse, and avowed his full belief that the book was a revelation from God, and of equal authenticity with the Old and New Testament. What number of hearers he had we are not informed, but for the honor of intelligent man, we hope and trust his followers are and will be "few and far between." This matter must be the ne plus ultra of fanaticism and delusion. If men will go beyond this in belief, verily there can be no end to their credulity. Note 1: The Mormon preacher at Canandaigua, Ontario Co., NY was almost certainly the Rev. Sidney Rigdon, newly arrived from Mentor, Ohio, on a visit to Palmyra, Fayette, Colesville, and stopping points in between. At about this same time (Jan. 1, 1831), the Wayne Sentinel speaks of "Rigdon dipt in many waters," who "Preaches Gold Bible to the loafers." This shows that Rigdon was preaching from the Book of Mormon in or near Palmyra by the last days of the year 1830. The Rochester Gem of the 25th tells that, "In Canandaigua... there is a book of Mormon preacher, who is attempting to push his way forward, in spite of all opposition." Note 2: The Jan. 5, 1831 issue of the Fredonia Censor reprinted a report from the Canandaigua Ontario Messenger of Wednesday, Dec. 29, 1830, saying that "a preacher" of the "Golden Bible" had "delivered a lecture" in that town [Canandaigua], on "Thursday evening last." This "preacher" was most certainly the Rev. Sidney Rigdon, and the newspaper notice fixes at least one of Rev. Rigdon's addresses on the Book of Mormon, in Canandaigua, to the late hours of Dec. 23, 1830. Possibly Rigdon gave an earlier lecture in the area a day or two before the "Thursday evening" assembly -- since the news of his preaching there must have taken some time to reach the editors of the Gem and Republican in Rochester. That Rigdon was then in southern Ontario Co. is further demonstrated by the fact that he missed picking up one letter addressed to him, and received by the Manchester Post Office, well before Dec. 31st -- see the letter Dec. 31 letter list published in the Ontario Phoenix of Jan. 19, 1831. Such unclaimed communications typically sat in the post office about a month before they were listed in the local newspapers. (See notes attached to the Phonenix item for more chronology for Rigdon's trip to New York). Note 3: In the Early Mormon "Chronology" appended by Dan Vogel to the fifth volume in his Early Mormon Documents series, the writer dates Rigdon's preaching at the Canandaigua courthouse to "late December," and says that the early convert, Ezra Thayer, "mistakenly dates the event to October 1830." In his 2004 biography of Joseph Smith, Jr. (on page 550) Vogel dates the first documented meeting between Rev. Rigdon and the Canandaigua editor, W. W. Phelps, to "24 December." Given the likelihood that Rigdon was already in Canandaigua a day or two prior to Dec. 23, 1830, it is not improbable for one to assume that the two men met prior to "24 December." Finally, it does not lie beyond the limits of logic, for the modern student of history to assume that Rev. Sidney Rigdon spent a good deal of his allotted time in Canandaigua in the company of Mr. Phelps. AND FARMER'S & MECHANICK'S ADVOCATE. ns. Vol. I. Brockport, New York, Wednesday, December 29, 1830. No. 13. THE NEW BIBLE -- Some year or two since, the credulous were amused with the tale that, guided by inspiration, some one had found many golden plates buried in the earth near Palmyra, Wayne county, in this state, upon which were revealed, in an unknown tongue, (an odd sort of revelation, one would think) the whole duty of man. -- The finder and a comrade were enabled; by supernatural agency to translate; since the book has been printed and travelling preachers have gone forth with it, to enlighten the world. Some of these have rested for a season in the vicinity of Painesville, Ohio, where a preacher of another faith was converted to the new, and a band of followers, amounting to more than one hundred, added to his train. -- Buf. Jour. ns. Vol. I. Brockport, New York, Wednesday, January 5, 1830. No. 14. BOOK OF MORMON -- In the second number of the GEM, we gave a full length portrait of this bantling of wickedness and credulity. By a late Painesville, Ohio paper, we perceive that this pretended revelation from heaven has found some believers, and that there are preachers travelling about in those parts who pretend that it is the only revelation which men can safely live and die by. In Canandaigua, it is also said, that there is a book of Mormon preacher, who is attempting to push his way forward, in spite of all opposition. The reason for these efforts is obvious. When the work spoken of came before the world, it proved to be such a spawn of wickedness that the press aimed a blow at it, and it fell, ere it had scarce seen the light. The getters-up therefore, seeing their hopes all blasted, and their names coupled with infamy, have determined to 'make a raise' on the public by some means, and thus they are going about "like roaring lions, seeking whom they may devour." We do not anticipate a very great turning to this heresy. The public are too much enlightened. -- Rochester Gem. Vol. V. Rochester, New York, Wednesday, April 20, 1831. No. 1369. Died, in Kirtland on Tuesday night last, Mr. Warner Doty, aged about 29 years. The deceased was one of those who had embraced the imposition of Jo Smith, and was a victim to the delusion of Mormonism. He was duly commissioned after their manner, to preach, and was one of the most active and zealous in the cause. So fully did he believe in the divinity of Smith, that he had been made to have full faith that he should live a thousand years -- this he confessed to a near relative some four weeks before his decease. Five days before he expired, he was suddenly attacked with an inflammation in the bowels, which afterwards assumed a typhoid appearance. He was immediately removed to the residence of his parents, who had no faith in the Mormon remedies for the cure of diseases. No persuasion could induce the young man to have a physician called, so strong was he impressed with the supernatural powers of Smith. Several of the Mormonites soon assembled around the sick man, where they continued to encourage him to persevere, and strengthen his delusion, telling him that he was getting better and soon would be well, till they saw he was about to expire, when they all fled from the house, without offering to assist in the last sad solemnities of the dead. Smith was sent for soon after he was taken sick, and proceeded towards the house of Doty, to heal him, but (as Smith said) he received a command not to go to Doty's and "cast his pearl before swine." He however visited the sick man a day or two after, and said he would get well, and protested against calling a physician. He held his hand upon the head of Doty for 10 or 15 minutes, but with what object is not known. A few hours before the young man expired, Dr. Brainard was sent for, much against the will of the worshippers of Smith, by the interference of other friends. The Doctor immediately pronounced his disease past remedy, and told the Mormon doctors that their superstitions had probably been the means of the young man's death, or something of like import. When the young man discovered that death was nigh, his faith in Smith's pretensions seemed to forsake him. He said "What a wonderful mistake I have made," and called all his friends to take his leave. Addressing himself to an old man of the Mormon faith, he said "you are a friend to every body -- I must shake hands with you -- this is a lesson that I have learnt by actual experience, by which you ought to profit, but with me it is too late." The Mormonites will probably contradict many of these statements, as they have many positive facts heretofore; but we have our information from a relative of the deceased, who was present during the last 18 hours of his life, and whose intelligence and veracity will not suffer in comparison with the whole of those deluded people who have adapted Jo Smith as their spiritual leader. -- Painesville Telegraph. Warner Doty, aged about 25, pretended he caught a revelation in the air which was a commission for him to preach Mormonism to foreign nations. His uncle, Nathan Goodell, said he wrote it to fool him. Doty had a fever. The Mormons took charge and watched with him day and night. His mother became alarmed and called Dr. Brainard, who told her it was too late, altogether too late. The watchers had been instructed when the fever turned to send for Jo and Rigdon. They came and laid their hands on him and pronounced him healed and told his mother he would recover because they had received a revelation that he was to preach to foreign nations. Doty soon died, being the first Mormon to die in Kirtland. Vol. V. Rochester, New York, Tuesday, April 26, 1831. No. 1374. "Oh my Servant there is a great work for you and the other two of your brethren. I send a messenger to tell you where to go and find a piece of parchment that shall contain these words: -- You shall teach repentance and remission of sins to all who shall come in the sound of your voice -- I command you that you do these things in sincerity and in truth; and if you do you shall be blessed. The time is shortly acoming and is not far distant, when you shall be bound together for life -- the names of your brethren are these, Burr Riggs and Edson Fuller, and if they are not faithful I will choose another in their stead -- my work must be done. My servants, you shall go forth from place to place and if you are true to your trust they shall hear. Remember that I am the Lord your God -- serve me above all others and I will bless you, in the end, amen. "That you had a messenger tell you to go and get the other night, you must not show to any son or daughter of Adam. Obey this and I will stand by you in all cases -- my servants obey my commandments in all cases and I will provide. | Be ye always ready,  |  shall call. "There shall be something of greater importance revealed when I shall call you to go -- my servants, be faithful over a few things, and I will make you a ruler over many. -- amen -- amen -- amen." To the disgrace of human nature, we are compelled to say, that there are some hundreds of civilized beings who actually believe that documents similar to the above have been written out by the finger of God, and sent down to certain persons. Many will indeed tell you that it is not a subject of belief with them, because they know it to be so, but alas! they are commanded of Heaven not to inform the world how they know it!! Note: The above reprint from the Painesvlle Telegraph is missing the original article's final lines: "We have other documents of a similar description on hand, from the factory of Smith, Rigdon & Co. which will be forthcoming. We can assure our readers that we take no pleasure in publishing any thing on this subject. But we always deemed it as a bounden duty to expose every base imposition which may be attempted upon the credulous and unsuspecting. For this reason we have endeavored to hold up Freemasonry naked before the world, and for this we must hold up Mormonism, as fast as we can obtain its secrets. The one screened itself from public view by horrid oaths and the fear of death -- the other is endeavoring to do the same thing, by impressing upon the minds of its victims, a belief that the wrath of God will abide upon them for disclosing to the world any of its mysticisms." Vol. V. Rochester, New York, Thursday, May 5, 1831. No. 19. They believe that they are themselves "the beloved people" of the Great Spirit, as the ancient Israelites did; that they were the peculiar, chosen people of God. The Indians also believe in a future state of rewards and punishments, to be distributed according to the characters which are sustained here. If now we compare these religious views and traits with those of the debased & idolatrous heathen, in Asia, and other parts of the world; we shall discover a difference for which it will not be easy to account, but by supposing the remote ancestors of the American Indians to have been acquainted with Divine revelation. Note: From the Sept. 1826 issue of the Unitarian Christian Magazine, published Boston. For an earlier reprint see the Pittsburgh Recorder of Oct. 3, 1826. Vol. XV. Rochester, New York, Tuesday, May 17, 1831. No. 20. W. W. Phelps, editor of the Ontario Phoenix, has recently been scurvily dealt with, if we may believe his statement, by some of his anti-masonic brethren. Travelling to Palmyra to investigate the Book of Mormon, he was arrested and placed in safe keeping in the jail at Lyons! This was an inconvenient place for an editor, and he shows that he feels the indignity intensely; and, that if his wrongs are not righted up soon, he'll make the welkin ring with his eloquence. The atlas of Ontario anti-masonry has rested on his shoulders some three years. In November next, he threatens to scatter the party to the winds, if he is not honestly dealt with before that time. Vol. V. Rochester, New York, Thursday, June 9, 1831. No. 24. The Golden Bible, or the Book of Mormon. -- The believers in the sacred authenticity of this miserable production, are known by the name of "Mormonites," and their book is commonly called "the book of Mormon." It is asserted by them that their number in this vicinity is four hundred. In a conversation a few days since, with a gentleman of Kirtland, well informed, and every way concerned to give us the truth, we are assured that their numbers in the families in that town were two hundred souls. We doubt not then, that their whole number in this county and Cayahoga are at least four hundred. They have recently received an additional revelation from the prolific prophet Smith, which is generally understood to say that Kirtland is within the precincts of the holy land; but by others is said to mean only, that in that town will be a great gathering of mighty multitudes, preparatory to their westward general migration. They are therefore admonished to sell no more of their possessions but rather purchase, lest there shall not be room for the faithful. The admonition, however, arrived too late, as they have but fifty acres left, and the land holders refuse to sell to them. They profess to receive sensible demonstrations of the presence of the Deity. A few days since, a young man gave information to some of his brethren that he was about to receive a message from heaven. They repaired to the spot designated, and there, as they solemnly assert, a letter descended from the skies and fell into the hands of the young man. The purport was to strengthen his faith and inform him that he would soon be called to the ministry. They declare their solemn belief that this letter was written by the finger of God. The style of writing was the round Italian, and the letters of gold. The favored youth immediately attempted to copy the communication, but as fast as he wrote, the letters of the original disappeared until it entirely vanished. It is alleged that some of them have received white stones promised in the second chapter of the Revelation. Such of them as have "the spirit," will declare that they see a white stone moving about the upper part of the room, and will jump and spring for it, until one more fortunate than the others catched it, but he alone can see it. Others however profess to hear it roll across the floor. These two stories, and others of a similar character, are told by them with solemn assertions of their truth. Among them is a man of color, a chief man, who is sometimes seized with strange vagaries and odd conceits. The other day he is said to have jumped twenty five feet down a wash bank into a tree top without injury. He sometimes fancies he can fly. In Chardon, one man has torn away all the partitions of the lower part of a good two story dwelling house. Here a large number live together. The food consisting of meat and vegetables, it is said, is placed on the table in a large pan, which is the whole table furniture. From this every inmate takes a piece of meat and potato in his hand, and devours them as he walks about the room. As to matters of apparel, and indeed other things, where any one wants what he has not. he takes it any where in the family where he can find it unoccupied. All things are common. Note: The above article first appeared in the Painesville, Ohio Geauga Gazette on either Jan. 24 or Jan. 31, 1831.
ns. Vol. I. Brockport, New York, Wednesday, July 20, 1831. No. 42. The Mormonites. -- This infatuated people are again in motion. In their own cant phrase "they are going to inherit the promise of God to Abraham and his seed." Their destination is some indefinite spot on the Missouri river they say about 1500 miles distant. About 80 of them have recently been ordained and some have gone, others are about going, two and two, part by the western rivers and part by land, to their distant retreat, far away from the cheering voice of civilized man. Those who have disposed of their property go now, and such as have property, are making market for it so eagerly as often to disregard pecuniary interests, and all are to follow with all convenient dispatch. They still persist in their power to work miracles. They say they have often seen them done -- the sick are healed -- the lame walk -- devils are cast out -- and these assertions are made by men heretofore considered rational men, and men of truth. Man is a strange animal -- and the lesson before us ought to teach us humility for ourselves and forbearance towards the opinions of others; for though we are still of opinion that the leaders of this faction are as gross impostors as was Jemima Wilkinson, yet we have no doubt the great body of their followers are sincere and honest. Vol. XV. Rochester, New York, Tuesday, August 16, 1831. No. 83. W. W. Phelps, late editor of the Ontario Phoenix, the anti-masonic paper, has embraced the Mormon faith, and has been ordained as an elder, and been commissioned to preach. Vol. V. Rochester,New York, Thursday, September 15, 1831. No. 38. We had hoped, that ere this the believers in the Book of Mormon would have been entirely extinct, and that no individual, however credulous, could be found so blind to reason and common judgment, as to permit himself to be carried away by the absurdities of the Mormon doctrine. The frailties incident to human nature have in all ages invariably shown themselves, either in remarkable lethargy, or an enthusiastic excitement, unsanctioned by reason or common sense. But the followers of the book of Mormon, if the accounts received be not inconceivably exaggerated, are amongst the most blind and deluded people we have upon record. Note: This garbled report, reprinted from the Bucks County Intelligencer, was extracted from an article originally appearing in the Palmyra, New York Wayne Sentinel of Aug. 23, 1831. The careless extraction of text resulted in the prophecies and "unseemly forms" of the followers of Joseph C. Dylkes (the "Leatherwood God") being interspersed indiscriminately with the activities of the Mormons, resulting in a complete jumble of fact and fiction. Vol. VI. Rochester, New York, Saturday, December 31, 1831. No. 1573. From a Correspondent of the Salem Gaz., now travelling in the west. Marietta, (Ohio.) Nov. 16, 1831. You are sensible how celebrated has become western New-York and the adjacent counties of Ohio, for their sects -- their parties -- their fanaticism, religious, political and _____. Their conceits are wild to the very farthest bounds of imagination. Wild is invention, and singularly successful in carrying into effect their solemn fooleries. -- You have heard of the Mormonites; newspapers having given detailed accounts of these fanatics; but perhaps their origin is not so well known. Mormonism is the fruit of religious excitement in this quarter, combined with roguery, ingenuity, and ignorance; frequently operating successfully on those who ought to know better. The inventors of this species of fanaticism are very simple personages, and were unknown until thus brought into notice. They are old and young Joe Smith, one Harris, a farmer, of New York; and one Ringdon, a sort of preacher, from Ohio, with several infatuated, cunning hypocrites. Old Joe was once a pedlar, and possessed all that cunning and shrewdness and small intrigue, characteristic of that description of persons. He had a smooth tongue, was a ready story-teller, full of anecdotes he had picked up in his peregrinations, and had been more fortunate in picking up materials for his tongue, than for supplying his purse. He at one time set up the manafacture of gingerbread, but on the fall of that article, failed in business. Young Joe was an idle, strolling, worthless fellow, although he afterwards flourished so largely in the Mormon religion. He was, however, the son of a Yankee pedlar, and brought up to live by his wits. Harris, whom I have mentioned, was considered as a substantial farmer near Palmyra, of a wild imagination, full of passages of scripture, had heard and seen much of the extravagance of the day produced by modern revival meetings, and believed fully in the wonders and miracles wrought on these occasions. These were times, and these are a people admirably suited to the promulgation of a new bible and a new religion. * * * In such times, and such circumstances, was bred the Mormon religion. In this age of wonders, the cunning ex-preacher from Ohio, suggested to the money-diggers to turn their digging concern into a religious plot. It was therefore, given out that a vision had appeared to Jo Smith, that there was deposited in the hill I have mentioned an iron chest containing golden plates on which was engraved the "Book of Mormon." These engravings were said to be in unknown characters, to all but the inspired translator, and were deposited there by a wandering tribe of the children of Israel, before the Christian era. It was now given out that young Joe Smith was the chosen one of God to reveal this ministry to the world -- to be the second Messiah, to reveal to the world this word of life, and to reform it anew. So Joe, from being an idle, lounging fellow became a grave, [parson-like] man, with a respectable looking sort of a black coat, and with the salvation of the whole world upon his shoulders. Old Joe, the ex-preacher, and several others, were the converts to the new faith, which they asserted was foretold in the bible. But Harris was undoubtedly a true convert, and the first man who gave credit to the whole story. He was the Ali of the New-York Mahomet. Ringdon, the preacher, knew well how to work upon the credulity of a people already excited to religious enthusiasm. His aspect was grave and contemplative, and he could quote abundance of scripture to prove his assertions. This ex-parson is no doubt the author of the book. It is full of strange narratives, in the style of the scriptures, and appears to evince some ingenuity. A fac simile of the characters on the golden plates, was carried to Dr. Mitchell, by Harris. The Dr. gave some learned observations on them, but wiser heads than he were employed in the translation. Harris raised money on a mortgage on his farm, and got the translation printed at Palmyra. The book came out to the world, and the diggers soon found they had not dug for money in vain, for by its precepts, money could be raised in a twinkling from the new converts, who were daily flocking to the new standard. Another revelation now came upon them. -- The prophets were directed to lead the way to the promised land, a place near Painesville, Ohio, and subsequently to some place on the Mississippi river, where they have adopted some of the worldly views of the Shakers, having formed a sort of community system. The roads in Trumbull county were at times crowded with these deluded wretches with their wagons and effects, on their way to the promised land. The infatuation of these people is astonishing beyond measure. Husbands tearing themselves from their wives and such of their families as refuse to go, and wives deserting their husbands, to join the infatuated clan. A respectable physician of Trumbull county, who informed me of the latter proceedings, also informed me of several instances where the sick have died, refusing medical aid, persisting in the belief that faith in the Mormon religion would save their lives. That he had actually been called in cases of the last extremity, where their faith had finally failed them. Note: The above article apparently first appeared in a late 1831 issue of the Massachusetts Salem Gazette. The account given here generally paraphrases James G. Bennett's two-part, on-the-scene report, published in the Morning Courier & New York Enquirer of Aug. 31, and Sept. 1, 1831. Another version of the Salem Gazette article appeared in an early January issue of the Philadelphia U. S. Gazette. It was reprinted from there into newspapers like The Churchman of Feb. 4, 1832 and the Farmers' Herald of Jan. 18, 1832.